Western Australia is known for its great deserts with oases of emerald green, long untouched beaches and lush tropical rainforests in the north. See more on Western Australia. WA is also known for its great seafood, including western rock lobster, as well as scampi, southern bluefin tuna and scallops. Barramundi is one of Australia’s favourite fish for eating and well worth trying. You can find fine wines at Margaret River in the South West of WA. 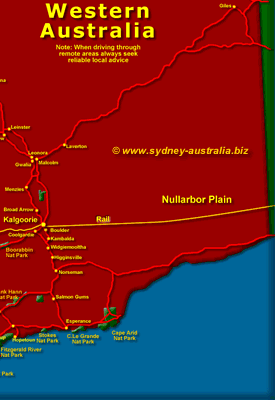 The area is also growing in popularity as a famed gourmet region and is not far from Perth, about 50kms south. There are even boutique beers made here and the region, located on the west coast, has great surf and beautiful beaches and coastline. Swan Valley, just 20 minutes from Perth, is another favourite for food and wine lovers. Situated in the beautiful Swan Valley alongside the Swan River, there are cruises and tours available that concentrate on gastronomic delights. Broome, to the north of Perth gives one a chance to explore even more wild and pristine coastline, with long beaches and vast wilderness areas. 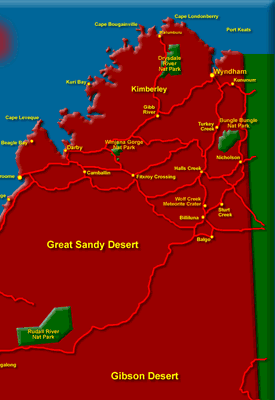 Because of vast distances involved between many of the places in WA, you can find places that offer both luxury accommodation while never being far from beautiful remote areas, untouched by man. There is much more to explore here, the Gold Mining Areas in the desert and the tropical jungles of North Australia offer unique experiences that you will never forget in a lifetime. Diamonds are mined here beside gold and opal, so where better to look for bargains? See about jobs, employment and visa requirements Work in Australia - Jobs. Western Australia accommodation includes hotels, motels, luxury resorts, caravan parks, camping, bed and breakfasts and farm stays. 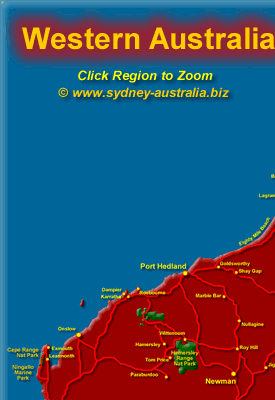 For Hotels throughout Australia, see Hotels in Australia. 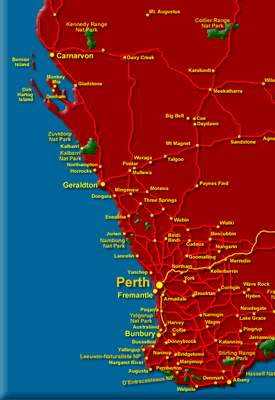 Main Photo: Tourist Map of WA - Click to Zoom Area or see the Perth Map.